Sometimes it seems like we are going to the gym and putting in the work, but don’t get stronger. When I talk to people about their training, 9 times out of 10 it is something quite simple that they are not doing. Be honest with yourself – what out of the list below are you not nailing? Progressive overload is a key principle of strength training. It means that you need to progressively (gradually) overload your body to force it to adapt. In other words, once you can do a certain weight for a certain number of reps, your body has adapted to that challenge. You need to find a way to increase it, in order to continue to get stronger. Humans are highly adaptive, and adaptation occurs in many different areas: muscles get bigger and stronger, connective tissue and bones get stronger, the nervous system becomes more efficient at ‘firing’ muscles, the body recovers better from training, the brain coordinates the movement better – and many more. switch to a harder variation. Whatever you do, increase the challenge in small, progressive ways – and you will get adapt and get stronger. To do this effectively, you either need to be following a good program, or you must record your weights, set, reps, rest and so on in a training journal and make sure you make some progress in each workout. Recovery is not just about resting. Recovery is the whole process of getting you back to peak state after you’ve just knackered yourself training. Most people’s recovery consists of taking a day off between training sessions. But recovery really starts as soon as you stop training. First, you need to get some protein and carbs in, to feed your muscles. And of course water to rehydrate. Not eating or drinking adequately after training will probably make you feel more tired and perhaps make you overeat later in the day. Then you need a good night’s sleep – ideally 8 hours – for your body to perform the overnight repair process. The next day you will benefit from gentle movement or active recovery to get blood flow to the muscles and help them recover from soreness. Walking is an easy active recovery activity, or some dynamic stretching routines (think yoga flow type movement). The thing about technique is that there is an ideal version – and then there are real people like you and me. Sometimes technique needs to be adapted to how we are and what we can manage. A tweak here, an adjustment there can make all the difference. Unfortunately you need to be an expert to spot these tweaks, or do a lot of research yourself. But if you can access that expert advice, it can save you months or years of wasted effort. Stance – how far apart your feet are. 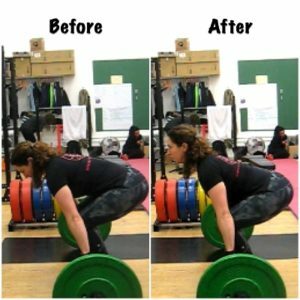 In squats and deadlifts, playing around with stance can sometimes make the difference. If you struggle with squat depth or balance, try a slightly wider stance. Core tension – there are many lifts where properly bracing the core and squeezing the glutes can make a difference to how much weight you can lift and how strong you feel. Any exercise performed while standing requires good core tension. Heavy barbell lifts like deadlifts and squats also feel stronger when you brace around the core. ‘Put your shoulder blades in your back pockets’ – Think ‘good posture’. Hunching the shoulders is a very common error in back exercises like rows or pull ups. Hunching the shoulders prevents you from using the muscles of the back properly, so you won’t get stronger in those areas. Moreover, in exercises that require you to hold a large load, like deadlifts, the upper back is sometimes the weakest link. Pull your shoulders down and back, and keep them there. 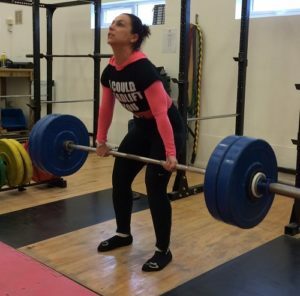 Read more: Is your deadlift stance too wide? This is a biggie! Many people I talk to are being held back not by their technique, or their recovery or anything physiological, but by a lack of confidence. Does this sound familiar? You know you should lifting a bit more, but you are afraid of getting hurt or not sure that your technique is good enough. It’s a nefarious trap. The lack of confidence builds on itself and gets worse, not better, as time goes by. If you lack confidence in your lifting, you will stall out. So get some help – or fake it till you make it! Sometimes just a little more patience and plugging away is needed. It can seem like other people are making faster progress than you. But this is not always the case – not everything is as it seems, especially on social media. Everyone is different in terms of how many days you can devote to training, where you are starting from, what physical issues you may or may not have when you start. Some lifts can be quite complicated technically or require a range of movement you don’t currently have. It won’t magically appear, you need to put the work in. The most important thing is to get into a routine. Even if you can only train once per week, make sure that you get that session in. Many people suffer from a stop/start schedule. It is harder to get stronger this way. You never really get going – it’s three steps forward, two steps back. If you think this might be you, have a look back at your last month’s worth of training. How many days did you go to the gym and get a training session in? Was it three times one week, but then zero the next? That could be your problem. This is something I used to see a lot with my strength training classes, until I changed the membership format to make it better value to come on a regular basis! Problem solved – suddenly all the people who were intermittently attending were coming on a regular basis, and making much faster progress as a result. I am willing to bet that unless you are a very experienced lifter with years of training behind you, the reason you are not making progress is that there is at least one thing in the list above that you are not doing effectively.